The West End Tavern is Grade II listed and dates back to 1762. 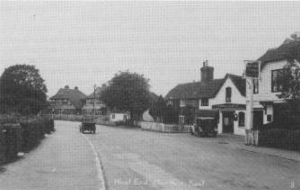 It is so named because it lies in the part of the village called the West End, where it stands on the north side of the main road. 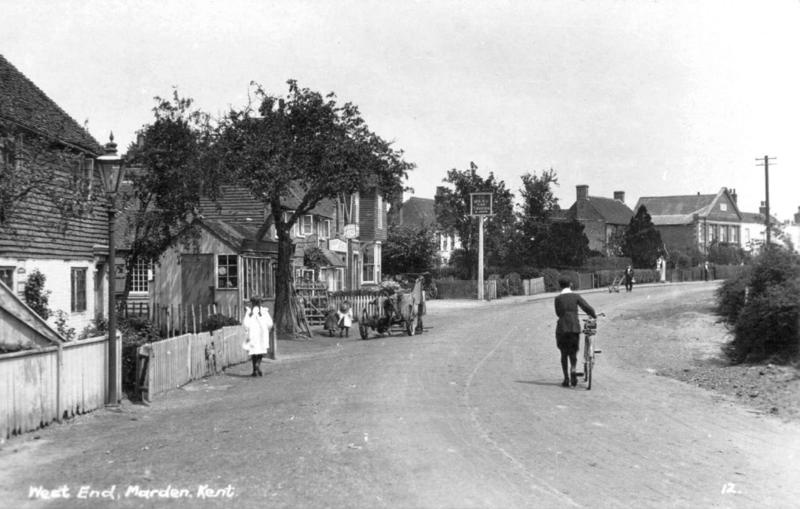 An undated picture, taken to be published as a postcard. The clothes suggest it is the earliest picture in the West End Tavern selection. Originally built together with the West End Forge to the left of the pub, records show that for a great deal of time the two businesses were run along together and the earliest record of occupancy found in the Kent archives is for 1836 when David Stanley Snr is shown as both the blacksmith and beer-seller at the West End Tavern. This is confirmed in the 1850 Maidstone Directory for the Environs when David Stanley Snr is still in residence at the West End Tavern, and his son David Stanley Jnr is occupying the Pig and Whistle (Royal Oak) at Chainhurst. By the time of the 1903 Beer Retailers Directory Listing, Horace Stanley is shown as the beer retailer at the West End and his name appears again in the Kelly’s 1911 Directory. 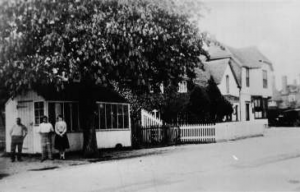 Later in the 1930s, records show that Kenward and Court (the Hadlow Brewers) owned this public house and Kenward Court Ales were served when Mr Waghorn and then Mr Mercer were the occupants. Hanging sign unchanged from previous view but ownership board over door shows now in the hands of Kenward and Court. The public house and blacksmiths businesses were still running in unison when George Arthur Rootes, a relative of the car manufacturing family, was in occupancy. He ran the two together, with the help of Bill Lavender, but George is remembered for rather favouring the social side of the pub business and forgoing the harder work of the blacksmiths. When, later, things became financially tight he was forced to sell the Tavern in 1937 and rely solely on the Forge for his income. George Arthur Rootes died at the Forge on 2 June 1940 and subsequently the forge business was sold to a Mr Johnson who continued until the final closure of the same in 1962. 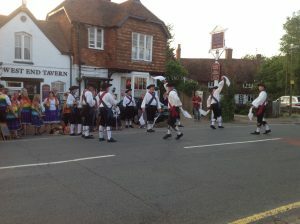 The Blacksmiths business with Forge House and the West End Tavern beyond. By the late 1940s Kenward and Court had installed both a new ownership sign and a new look to their hanging sign. 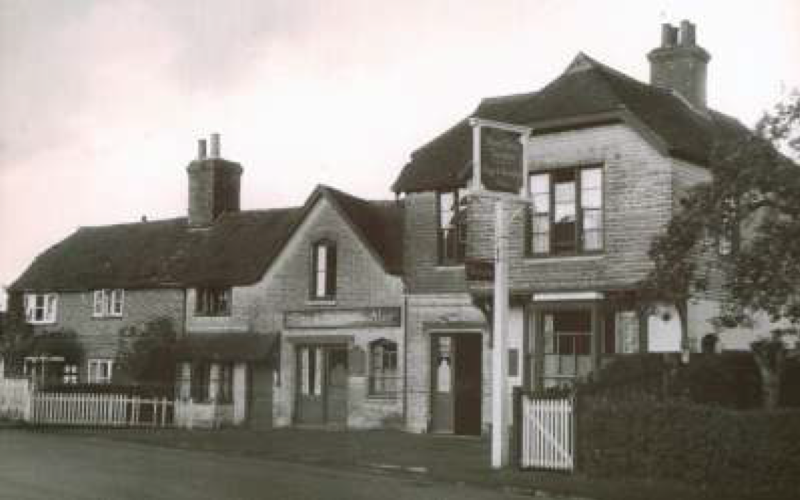 Jack Woodward took over as the pub licensee from 1 October 1937 and soon after, under Jack’s control, the pub became the most popular “beer house” among the Hop Pickers during the 1940s and 1950s. Jack remained until his death in the late 1960s or early 1970s. 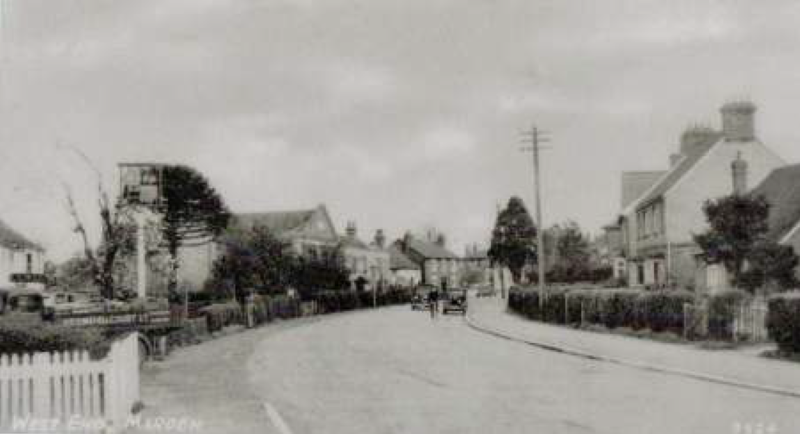 His widow Ethel (who appears to be remembered both for her glass eye and her nickname of Tupp – possibly a play on her maiden name of Jupp) then carried on the business for a few years. 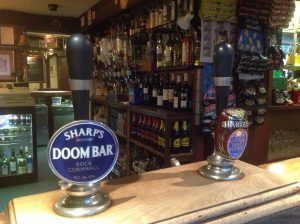 Some locals seem to think that Ethel’s father, Mr Jupp, might have either been a previous licensee or had a financial interest in the business. A Kenward and Court delivery to the West End Tavern. Kenward and Court were later taken over by Page and Overton (for only a couple of years) before they in turn sold out in 1954 to Charringtons. This pub is now run as a Free House. The building is very low-lying in relationship to the road and local people have mentioned times when in a thunder storm water used to run into the saloon bar and soak the carpets. Since I have lived approximately 20 metres from the West End for the overwhelming majority of my life, I suppose I have more memories of this establishment than of any of the other pubs & inns in Marden. My brother, John, was a school friend with Tom, the son of the long time landlord and landlady Jack & Tupp Woodward. The Woodwards had run the West End since before WWII and Tupp ran the place while Jack was away doing his wartime service. One of my lasting memories of Jack, who was (by today’s standards) grossly overweight is that he would be standing leaning on the far end of the Public Bar (I can’t remember anyone using the saloon bar during the Woodwards’ tenancy) with cigarette in hand. One would order a beer, but Jack would only move down the bar to serve you once he could see what payment was being offered. It was some time before I realised that this was so that he could bring the correct change and thereby save himself a second trip. 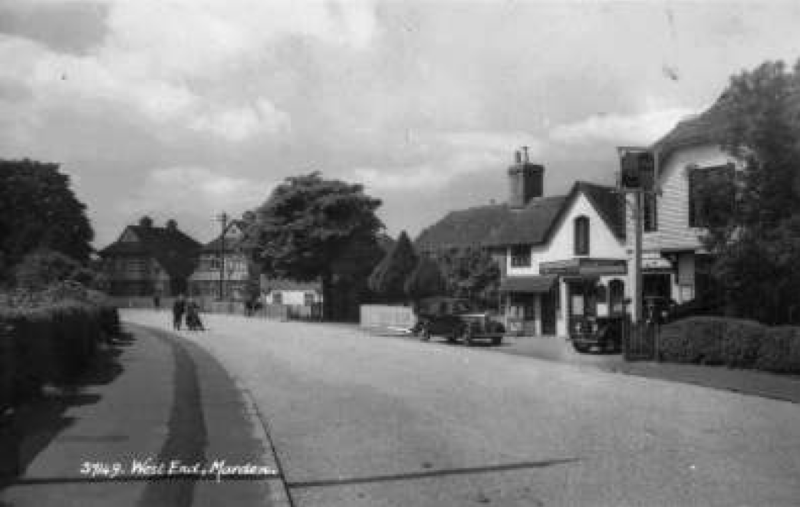 Two regular customers were senior members of notable Marden agricultural worker families. On the occasion of the NASA moon landing in 1969(? ), I was in the bar when one of these gentlemen stated to the other, “The Americans are going to the moon today”. There was a long pause and then the other chap turned, looked out of the window, returned to his drink and said, “They’ve got a nice day for it”. I’m still not sure who was taking the mickey out of whom! After Jack’s death, his wife Tupp continued to run the West End for several years. At that time the West End also had an outside Gents toilet. One day, Tupp suddenly rushed from behind the bar and clambered up on to the bay window seat. A few minutes later she banged repeatedly on the glass and shouted “Thank you very much”. She had apparently spotted a passing motorist stop to use the facilities without spending money in her pub. Tupp left the West End without announcing her departure to any of the regulars – she never did like any fuss! The new (and now free house) landlords were Bill and Margaret Gooding. We met them soon after their arrival and invited them round to our house, where we had recently completed some building alterations. These obviously made an impact on Bill because some weeks later I had a panic phone call from my wife, Pat, asking me how long it would be before I arrived home. Bill (not the most accomplished DIY exponent) had decided to knock down the wall between the public bar and the old ‘bottle & jug’ off sales room, only to discover as it started to sag that this was a load bearing wall. We managed to stop the collapse and arranged for local builder (and from then on regular customer and friend of the Goodings and of the West End) John Sutton to come in to make professional alterations.